Our electric fireplace suites combine a fire surround, a hearth and a cosy electric fire all in one package. Simply take it out of the box, fix it to a flat wall and plug it in. There's no need for a gas engineer or any specialist work and you don't need a flue or chimney. Simple! If the main focal point in your living room is currently the tv, or if your room needs a new feature area, an electric fireplace is a quick and easy way of creating a focus. 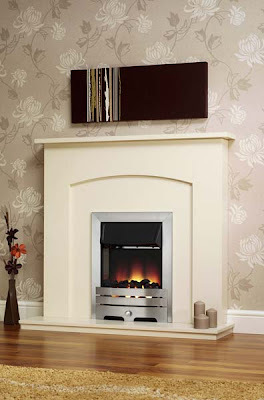 If wall or floor space is at a premium we also have a wide selection of free standing and wall mounted electric fires. These great fires and fireplaces are currently available for delivery before Christmas so, as well as keeping you warm and cosy through the winter, now everyone can have somewhere to hang their stockings! Pin It Now!